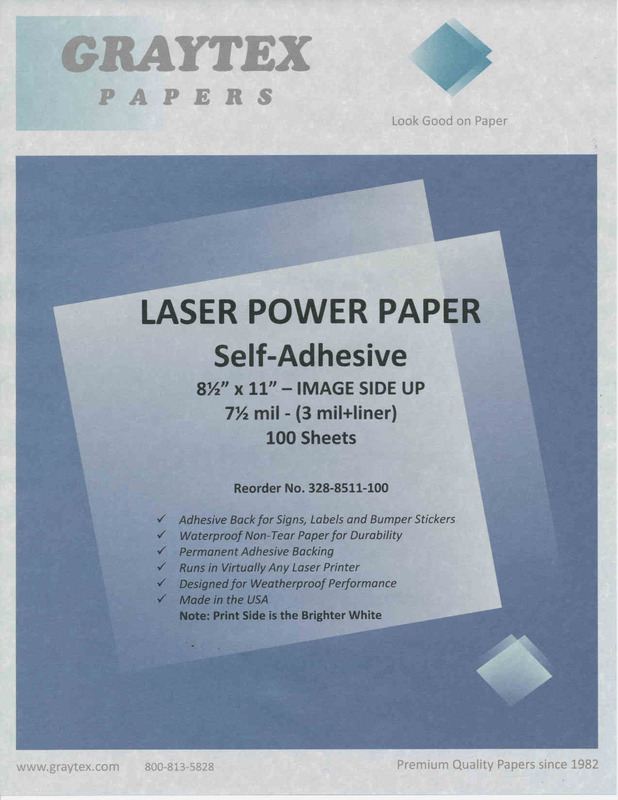 Power Paper Adhesive Laser Paper is a superior performance synthetic paper formulated for the ideal combination of application flexibility, excellent print quality with a practical level of survivability from water exposure. This label-backed version is best described as an outdoor self adhesive paper because of its proven waterproof performance. The print-side of the paper has a slight reflective glaze under direct light which enhances its presentation value, but it is not a shiny, coated paper, and is more akin to a standard sheet of bond paper in appearance. Examples of how this outdoor version of Power Paper is used include construction site labels, posted reference maps, shop diagrams, horticultural tags, many types of signs and other similar applications. This blank self-adhesive laser paper is an excellent outdoor document solution, ready for map making, or creating signs and outdoor labels. Recommended: try one of the sample packs before ordering a large quantity to determine suitability for your specific project.